Concussion is a temporary disturbance in the brain’s functioning as a result of a blow to the head. It is often also referred to as a minor head or minor traumatic brain injury (mTBI). Concussion occurs when the brain gets shaken around in the skull following an impact. This shaking can injure the brain, which can result in both immediate and long-term symptoms. A brief period of unconsciousness, or just feeling sick and dizzy, may result from a person banging their head getting into the car, playing sports, walking into the top of a low door way, or slipping over in the street. It is estimated that 75-80% of all head injuries fall into this category. In some cases, an individual may lose consciousness as a result of the head injury, but it is important to note that only around 10% of reported concussions involve a loss of consciousness, so it is important to not solely rely on this as an indicator. These symptoms can take place immediately following an impact to the head, or might develop hours, days or weeks later. They are normal symptoms to experience, and in most cases will improve by themselves within a couple of weeks. However, if any of the symptoms become problematic or persist, you might wish to speak to your GP about any further assessment that may be necessary. In the majority of cases, there will be no long-term damage caused by a concussion – if treated appropriately with medical assessment and rest. Occasionally, complications can arise from seemingly minor blows to the head, which is why it is vital that people seek medical attention following a concussion. HOW DO I SPOT SPORTS-RELATED CONCUSSION? Even a seemingly minor blow to the head can leave a person concussed, even if it doesn’t result in a loss of consciousness. Someone who has experienced a concussion might not be aware of it, or they might not admit to it for fear of not being able to play on. The symptoms of concussion are often hidden, and might not be obvious. In addition, concussion can be an evolving condition with the presentation of symptoms often delayed. It is therefore important for fellow participants, coaches, official and spectators to look out for any signs of concussion (see above), such as dizziness. If there is a suspicion of concussion, the individual should immediately stop participating and medical attention should be sought. If a concussion is ignored and the individual continues to participate while concussed, they could be putting their short and long-term health at risk as a secondary blow to the head could exacerbate the initial injury. In the weeks that follow a concussion taking place, it is important to get as much rest as possible. This is because the brain needs time to recover from the injury, and straining it can prolong the time it takes to make a recovery. Stay within reach of a telephone and have medical numbers at hand if you need them. Have plenty of rest and avoid stressful situations. Share this information with a friend or a family member who can keep an eye on your condition. Take painkillers such as paracetamol for headaches. DO NOT stay at home alone for 48 hours after the injury has taken place. DO NOT drink alcohol until you feel better, take aspirin or sleeping tablets without consulting a doctor. DO NOT play contact sports for at least three weeks without consulting your doctor. DO NOT return to driving until you feel you have recovered. If in doubt, consult your doctor. 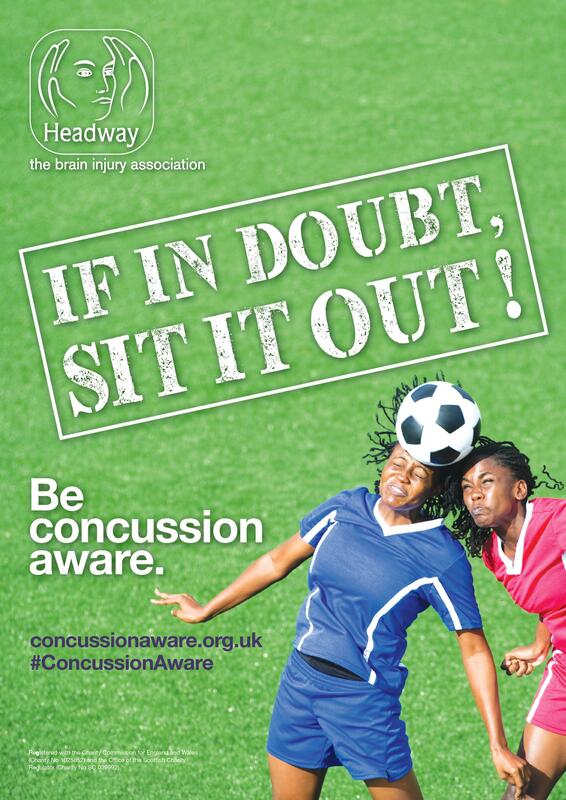 Further information on Concussion can be obtained from Headway UK – the brain injury association. Concussions can occur during general play in a playground or at home, as well as during sports such as football or hockey. A child or young person does not have to have been unconscious, or “knocked out” for concussion to occur. Recovery may be slower among young children and teenagers. Those who have had a concussion in the past are also at risk of having another one and may find that it takes longer to recover if they have another concussion. Is it before or after lunch? What did you have last lesson/class? 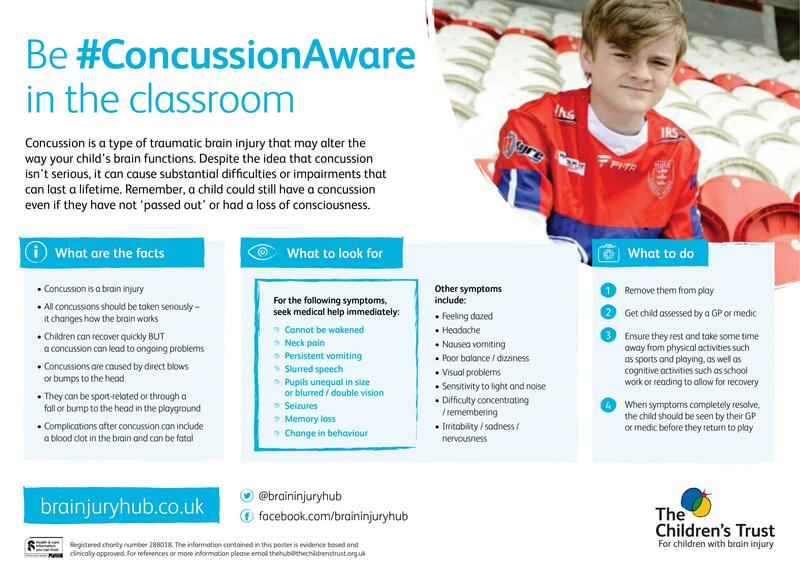 Further information on Concussion in Children can be obtained from the Child’s Brain Injury Trust and The Children’s Trust.